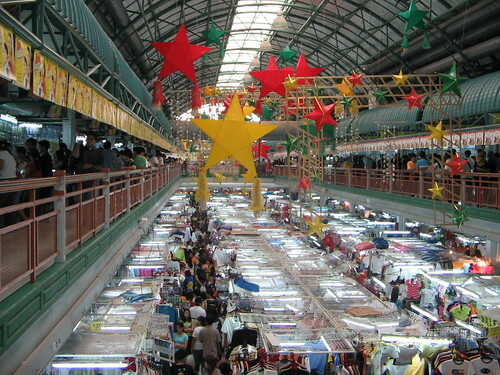 Tiangge means “bazaar,” in this case a tight gridwork of crowded stalls peddling discounted clothes, jewelry, accessories, electronics, and handicrafts in the hallways, plazas, parking lots, and other empty spaces between the various sections of Greenhills Shopping Center. Today being the practical tail end of the Christmas rush, the tiangge was a veritable crush of human traffic. The cellophane-wrapped stars are called parol, a traditional handmade Filipino Christmas ornament.